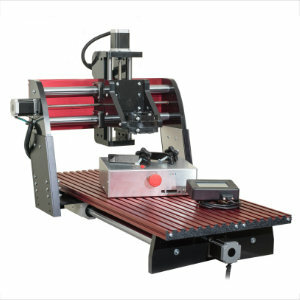 Manufactures quality benchtop CNC routers at a very affordable price. Options include a laser engraver head as well as a 4th axis! 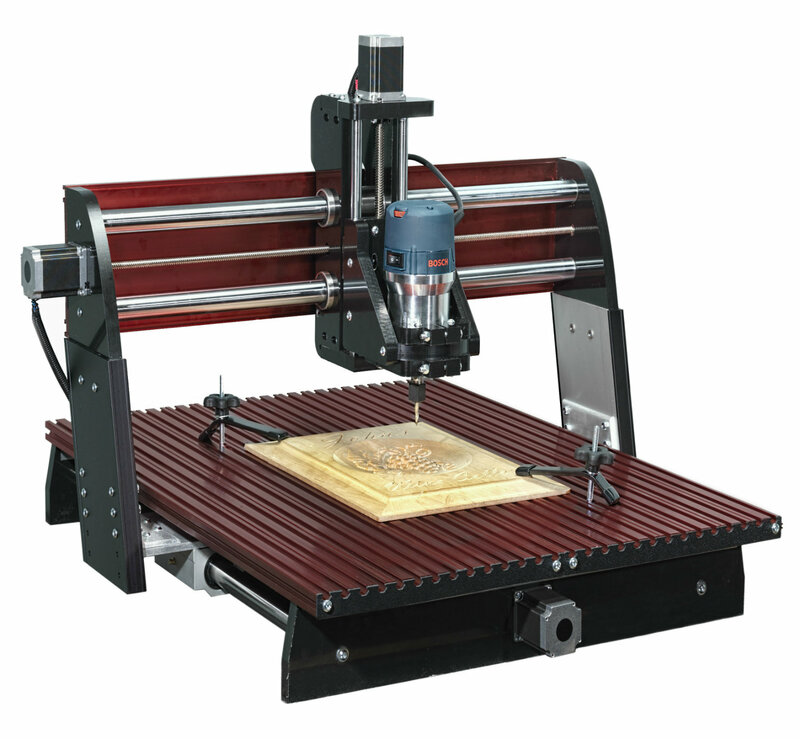 At an entry level price, the CNC Piranha FX® unit features all of the base capabilities as its cousin the CNC Shark®. 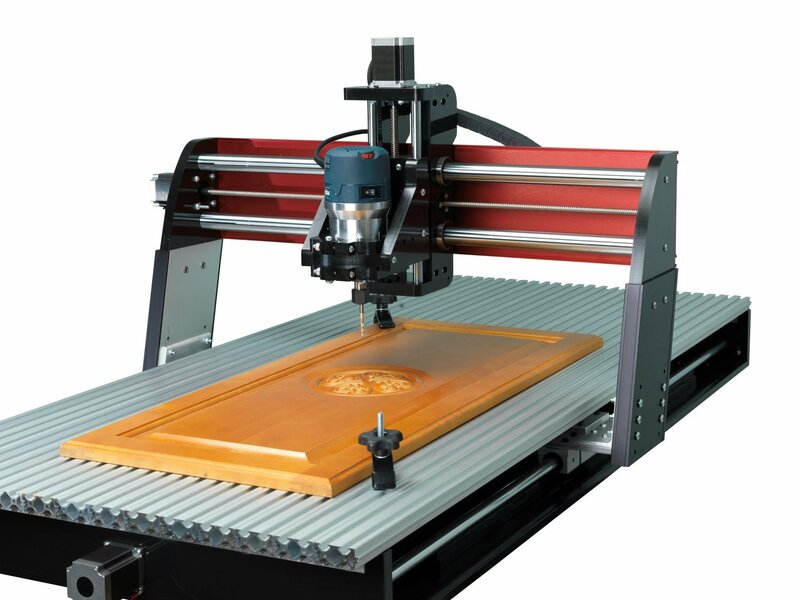 Its compact 12'' x 18'' table makes it perfect for projects like carvings, plaques, ornamental boxes and precision parts machined from wood, soft metals, or plastics, all at a fraction of the price of a large CNC. With its 3D carving capability, including a 3D models library, you can carve expensive corbels, cut intricate inlays, and create beautiful engravings. The CNC Piranha FX® base unit has such incredible accuracy that you can even engrave custom circuit boards with it. The creative potential is unlimited and the entire machine can easily fit on one end of your workbench. Thanks to the convenient touch screen interface, your computer no longer must be subjected to a dusty shop environment while you control the unit. Just design your work with the included VCarve Desktop V9 Design software on a PC computer with USB 2.0 port, then simply save the program directly to a USB flash drive, plug it into the LCD pendant, select your file, and hit the run button (Computer and flash drive not included). Put the power of the USA Made CNC Piranha FX to work for you today! The CNC Piranha XL® takes the Piranha series one step closer to a full size CNC for the fraction of the price. Its large 12'' x 24'' cutting area makes it perfect for projects like carvings, plaques, ornamental boxes and precision parts machined from wood, soft metals, or plastics. With its 3D carving capability, including a 3D models library, you can carve expensive corbels, cut intricate inlays and engravings. The creative potential is unlimited and the entire machine can easily fit on one end of your bench. Just design your work with the included VCarve Desktop V9.5 Design software on a PC computer with USB 2.0 port ( not included) Then simply save the program directly to a USB flash drive, plug it into the Pendant, select your file, and hit the run button. No need to have your computer subjected to a dusty shop environment. With a table measuring 16" x 36", the All New CNC Shark II® Now with Color Pendant Controller features a heavy duty gantry reinforced with plate aluminum and a rigid interlocking aluminum table. It has anti-backlash, wear-compensated high precision lead screws on all 3 axis and is built to handle your large 2-1/4HP routers such as the Porter Cable 890 series, Bosch 1617 series or the new water-cooled spindle from Next Wave Automation. (Spindle and Router motors are sold separately) To accommodate even greater torque levels, it features adjustable bearings to give more stability during heavy cutting. Perfect for carving and machining a large variety of projects made from wood, soft metals or plastics. Simply supply a PC computer with USB 2.0 port and any of the routers listed below, connect the USB cable to the controller box and load the software. Includes VCarve Desktop V9 Design software, Vector Art 3D Sampler Pack, and CNC Shark control software. The CNC Shark HD4® features a heavy duty gantry reinforced with plate aluminum and a sturdy interlocking aluminum table. Table dimensions: 28'' x 36'', XYZ travel: 25'' x 25'' x 7'', Overall dimensions: 36-1/4''W x 36''L x 24-1/2''H. It has anti-backlash, wear-compensated lead screws on all 3 axis and is built to handle large 2-1/4HP routers such as the Porter Cable 890 series, Bosch 1617 series or the new water-cooled spindle from Next Wave Automation. To accommodate the greater torque levels, it features adjustable bearings to give more stability during heavy cutting. Perfect for carving and machining a large variety of projects made from wood, soft metals or plastics. Simply supply a PC computer with USB 2.0 port and any of the routers listed below, connect the USB cable to the controller box and load the software. Includes VCarve Desktop V9 Design software, Vector Art 3D Sampler Pack, and CNC Shark control software. The CNC Shark HD4® also includes the NEW Virtual Zero software. This new and CNC Shark exclusive software ''maps'' the surface of your table or work piece and uses the map as a dynamic reference point. This virtually eliminates problems caused by warped or bowed work pieces. The extended base CNC Shark HD4® offers up to 50'' of Y-axis capacity—the largest of any CNC Shark to date. It is reinforced to handle larger routers up to 2-1/4 HP, including the Porter Cable 890 or Bosch 1617 Series routers. To accommodate the greater torque levels, it features adjustable bearings to give more stability during heavy cutting. With a table measuring 28'' x 63'', it is ideally suited for carvings and machining operations on larger signs, doors and other projects made from wood, soft metals or plastics. It boasts impressive power, speed, accuracy, and ease of use. Built from heavy gauge aluminum and high-density polyethylene construction, it will tackle any project you can come up with. Simply supply a PC computer with USB 2.0 port and any of the routers listed below, connect the USB cable to the controller box and load the software. Includes the latest designing software VCarve Pro V9, plus Vector Art 3D Sampler Pack, and CNC Shark control software. The CNC Shark HD4® extended also includes the NEW Virtual Zero software. This new and CNC Shark exclusive software ''maps'' the surface of your table or work piece and uses the map as a dynamic reference point. This virtually eliminates problems caused by warped or bowed work pieces. Progressive is very social. Join in the conversation!